Heather Giustino Blog: 40% off at Betsey Johnson! 40% off at Betsey Johnson! 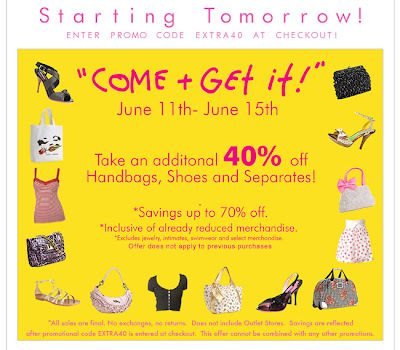 Oooh...40% off at Betsey Johnson, including sale items!! I'm wanting this and this and these! Happy shopping! So exciting! I hope there is a store down south, I'm heading down there this weekend. Sometimes I receive products and/or services compliments of various companies. I go out of my way to only share products I love and think my readers will too. I also am part of a few affiliate programs. This means if you purchase an item from a link I provide, I might receive a small commission. Again, I only share products and services that I would personally use and think are a good fit for my readers. Thank you for supporting the sponsors that help support my family! Coco's Ghostbuster Party - TONS of free printables!